As a bit of a space geek (don’t even get me started on my love of SpaceX), I’ve been planning for this weekend for a long time. I bought my eclipse sunglasses and started looking into lodging over a year ago, so you can imagine how excited I am for this event. Unfortunately (or fortunately, depending on how you look at it), it seems I’m not the only one who will be traveling north to watch the total solar eclipse. (Though you can see the sun 92% obscured in Denver, it won’t be anything like the experience of totality.) This has CDOT issuing all sorts of warnings about traffic over the weekend. I was curious about how much of a doomsday prediction these warnings were, so I conducted a quick Google Survey to find out. Though these surveys aren’t near as robust or scientific as the surveys we at Corona do for our clients, they are a great way to get a quick feel for how the public feels about an issue. In this case, I simply asked 125 Colorado residents if they were planning to travel north and, if so, where they planned to travel to. The results? Again, these are very rough numbers, but with 20% of those surveyed saying they are planning to travel to see the eclipse (out of 5.5 million Coloradans), that could mean that as many as 1.1 million Coloradans will be on the highway on Monday. 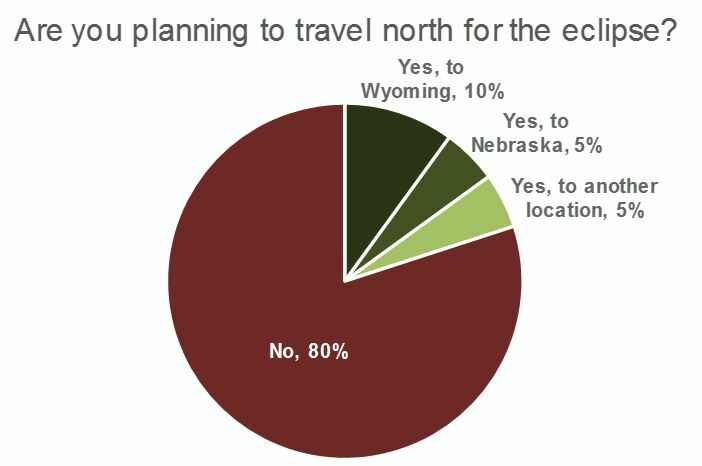 CDOT’s estimate of 600 thousand traveling to Wyoming doesn’t seem far off from the 550 million estimate this quick survey would indicate. Go anyway! Seriously, this won’t happen within easy driving distance of Colorado for another 30 years, and everyone I’ve heard speak about the experience says it’s completely surreal and unlike anything else you will experience. Plan for safety. If you have somehow been living under a rock and missed all of the safety warnings about needing eclipse glasses, here’s another one. Don’t look at the sun (except during totality if you travel north) without using eclipse glasses. If you don’t already have them, you can try finding them at local libraries or hardware stores. And if you can’t find them, check out community events where you could borrow from someone. 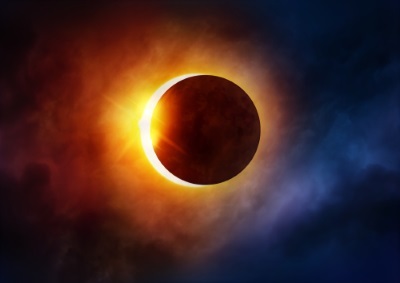 The process of the eclipse will take a total of almost 3 hours, so it shouldn’t be a problem to trade glasses here and there. And if you still can’t make that work, there’s always a pinhole camera. Plan for a good location. Many small towns in the path of totality are hosting events to watch the eclipse. That’s a much better option than planning to just stop at the side of the road somewhere. Plan for the worst-case traffic scenario. Though my hope is that everyone will be spread out enough that traffic won’t be as bad as CDOT fears, it’s a possibility that they’re entirely correct. Get gas early so that you don’t have to wait at overcrowded gas stations. Plan a variety of routes to get to and from your destination. Take food and water in the car so that you don’t have to swarm the handful of restaurants in the area that aren’t equipped to handle this kind of volume. Have fun! Try and relax, take your time when traveling, and enjoy the experience for what it is. Even if it takes way longer than you expect to get home on Monday, this may be the only time in your life that you get to experience something like this. I’ll be out of the office on Monday, and I hope that many of you will be as well. Enjoy the experience, and cross your fingers for clear skies!